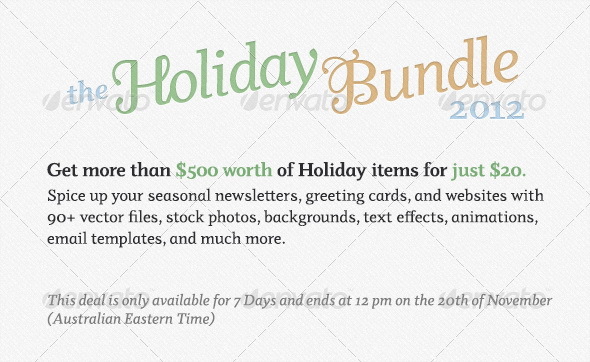 This Holiday Bundle is provided by Envato. its value is only $20, but it’s packed with more than $500 worth of seasonal design items from ThemeForest, GraphicRiver, PhotoDune, VideoHive, AudioJungle, CodeCanyon and ActiveDen. This is a shopping trip that you won’t want to leave until the last minute! These items will add the perfect dash of seasonal flair to your latest project and make it easy to send holiday greetings to your friends, family, clients, and colleagues. Due to the discount nature of this bundle, Envato Marketplace files bought in the Web Designer Pro Bundle will not be eligible for updates or support from their authors. This is an ‘as-is’ purchase. Don't miss out — this is a unbeatable value! Get your copy now!. Note : The Holiday Bundle will only be available until 12pm on the 20th of November (AEDT).